on the North Coast 500 route. Still owned by the family who built it ,in a stunning location. open March to October for weekly lets. Had a fantastic week. Had excellent communication with Fiona (owner). Wildlife in abundance and fantastic weather. Had spectacular views of sea eagles the first three days, they flew right over the cottage twice a day. Magnificent birds. Looking forward to visit #4 soon!! We are always extra delighted to welcome back previous guests. You obviously love and appreciate Hill Cottage and its location as much as we do. Haste ye back. Excellent communication prior to stay. Stunning location away from it all. Wildlife in abundance and scenery changes each hour with different sunlight. Take binoculars / telescope to get even better views. It was an absolute dream. In the middle of the wild. We could not imagine a better place for our vacation. Ideal for those who like it quiet. Simply fantastic, wonderful cottage, amazing scenery, incredible wildlife and so enjoyable we've booked already for next year. The big plus of the cottage is its very beautiful and peaceful setting. It is a pleasure to spend time there, enjoying a panoramic outlook and usually only hearing natural sounds. Especially so, as the main road up to Durness is now rather busy. There were a few niggles with appliances – the toaster seemed past its sell-by date and the grill in the oven was also slow, But everything else that I used was fine. Had to lubricate the door locks, which became very ‘notchy’. For a single occupant/driver, having been warned to keep sheep out of the garden, the gate on the steep access might have made this very difficult – but luckily there were no sheep around during my stay. For someone interested in birds, as I am, the constant turnover of birds at the feeders in the garden, and the other species visible and audible roundabout, meant that there was always something of interest to observe when at the cottage, whatever the weather. The whole coastal area is very good for seabirds, with the piece de resistance being Handa, the ferry for which is close by. I saw 89 species during my stay, with Kyle of Tongue and Knockan Crag my longest excursions north and south, respectively. All in all, a great ‘away from it all’ location. 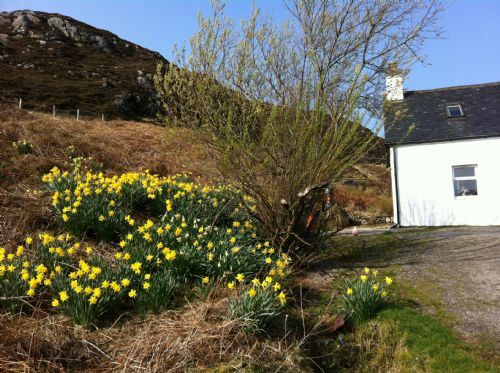 I'm delighted that David enjoyed his stay at Hill Cottage , it's stunning location and proximity to Handa Island. I am sorry that he had some 'niggles' with appliances. Both the House keeper and Caretaker live in nearby Scourie and their contact details and mine as Owner, are displayed in the cottage . If the guest had contacted us during his stay we would have endeavoured to address any of the points raised. We do ask guests to keep the garden gate shut as the cottage sits on a working croft. This does require some getting in and out of your car as we know too. Thank you for taking the time to review your stay at Hill Cottage. We had an excellent stay. The cottage is situated in a quiet, peaceful location with fabulous views. Really well equipped for its' remote location. We didn't use the living room at all, preferring to sit in the conservatory where the view was best! Great that it's dog friendly and our dog loved the large garden which is very secure. No issues with water supply despite it being 'off grid' and water pressure was good! If you want to get away from it all and truly relax at peace, this place is for you. You can do as much or as little as you want. Great that there was WIFI to keep in touch with home but almost a bit disappointed it was available because you can't but help use it and can't be truly 'tech free'! Plenty books/games at our disposal which we took advantage of. We'll return in the future. Thanks Fiona! Comfortable house, too many places to visit to mention here - lovely area for walking everywhere. I love the area anyway but Hill Cottage was in an excellent location for almost all round views. I would have preferred prior warning that the water may not be fit for drinking by everyone. I boiled it, let it cool then drank it from my flask as I walked along - but my coffee, when indoors, tasted ghastly - the only difference in making it was the water supply. I wasn't too comfortable with the arrangement with the keys. The bending to get them out of, or put them into, the click lock-seal box could be tricky when there were voracious midgies trying to get up one's nose. However, we had everything we needed in the house and so many places to visit - by walking or driving (then walking) that we had everything we needed indoors and out for a comfortable and energetic stay. We loved watching the birds from the conservatory. The elevated coastal location of the cottage is stunning, with beautiful, ever changing views over the sea loch from the sun room and outside table. The peace of the location is extraordinary. If you stayed at the house you would see no other human all day, except maybe a lone kayaker or the salmon fishery boat on the loch. However, you would become aware of the non - human inhabitants with which you were sharing this pristine environment. Wildlife is abundant, deer, buzzard, cuckoo, twite, snipe, geese, common garden and sea birds seen from the garden (and in the garden) every day. Very handy for Handa Island, which is both beautiful in itself, and abounding with sea birds. We enjoyed evening walks doing the loop to Tarbet and back. The house is basic but comfortable. The necessary simplicity of the arrangements in this remote location add to the charm. The booking and arrangements are straight forward and the owners friendly and helpful. If you want a complete getaway in a beautiful wild place, complete peace and relaxation, Hill Cottage is ideal.